We are very happy to announce that the 2014 Texas NORML Voters’ Guide is now available for distribution to voters! Because of law changes in 1997, Texas must change all drug laws at the state level and through the legislative process. Therefore, we are reliant on our elected state officials who only meet for a 140 day session every two years. 1. Educate on registering to vote – http://votetexas.gov/register-to-vote/ This is the only way we can be eligible to vote for cannabis-friendly candidates. Register to vote, it’s Texas’ only hope! The deadline to register is October 6th 2014. 2. 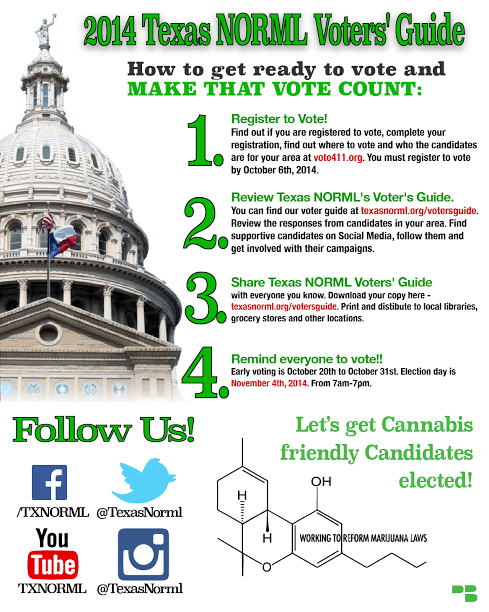 Share the 2014 Texas NORML Voters’ Guide with all of your friends and family and through social media. Put this Guide on blast! 3. Print and distribute. In addition to the obvious cannabis consumer friendly locations, consider printing up stacks of the Voters’ Guide and leaving them next to the League of Women Voter’s Guide at you local grocery stores and libraries. 4. Look up the State Representatives and State Senators for your area using http://www.fyi.legis.state.tx.us/Home.aspx. Find supportive candidates on social media and follow them. Encourage your members to volunteer for their campaigns. Build relationships and plan on staying in touch throughout the legislative process. 5. Remind everyone to vote!! Early voting is October 20th to October 31st. Election day is November 4th, 2014. Let’s get cannabis friendly candidates elected in Texas!